Addaptron Software announced the release of Stock Market Forecast Tools SMFT-2. It is a new integrated system, the next generation of the software that intended to replace older SMFT-1 version. As a result of a few recent development projects, the new version is based on new advanced methods, provides more accurate prediction, and is easier to use. Prediction modules is built with back-test calculation to estimate the accuracy of forecast within the recent performance periods. Additionally, the back-testing computations is important if more than one method is used. It allows estimating the weight of each method in a composed result; the weights that are proportional to the ability of the methods to predict the price. TA Predictor – prediction for day or week period based on technical analysis, pattern recognition and Neural Networks (generates composite result). Back-analysis models optimization and batch calculation for comparative analysis included. Waves – Elliott Wave model: back-test optimization, up to 10 waves forecast. Cycles – prediction based on cycle analysis. Week day – search for maximum performance using price behavior depending on week day. It allows discovering the best entry/exit days of week; batch calculation included. Month day – search for maximum performance using price behavior depending on month day. It allows discovering the best entry/exit days of month; batch calculation included. The implemented methods are statistically proven and widely used. All modules share the same EOD (end-of-day) input data. The software is provided with a free Downloader that allows downloading EOD historical quotes files from the Internet for free. A fully-functional software SMFT-2 is free during initial 30-day period. The software and associated documentation are delivered via download links over the Internet. For technical requirements, installation instruction, and download link, visit SMFT-2 download page. 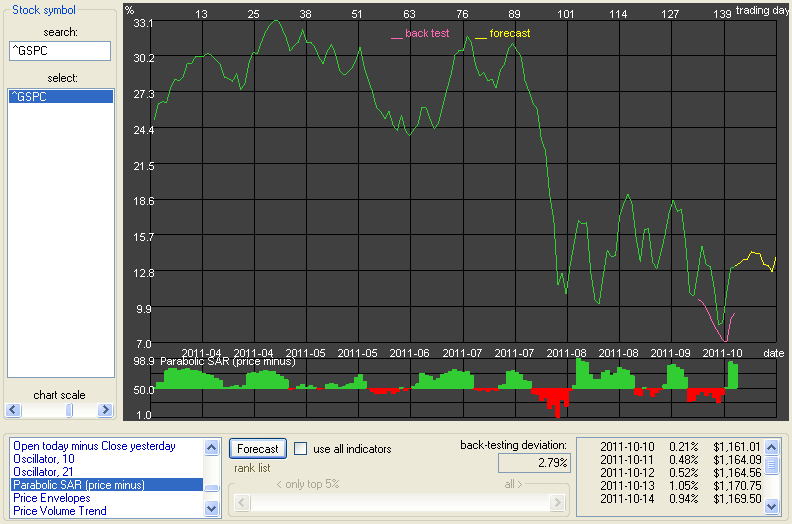 Addaptron Software released a new version of Stock Market Forecast Tools SMFT-1. The software includes several improvements: models optimization, more different input file formats, and optional free Downloader. 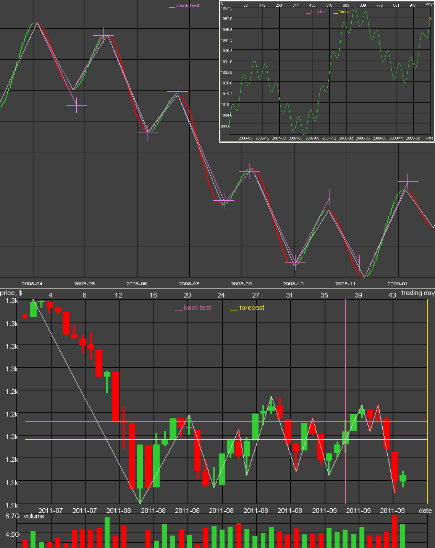 SMFT-1 is an integrated system that includes three major software modules: FTA-2 – a modified version of InvAn-4 that is a comprehensive tool used by serious investors for many years, the most popular software program SMAP-3 for stock market cycles analysis and forecast, and Neural Network Stock Trend Predictor NNSTP-2. “Technical analysis” – more than 50 popular technical indicators; chart analysis; indicators (each separately or all) used as input for Neural Network (NN) to build 10-day price forecast. The forecasts from all indicators result into a single forecast – each forecast added with the weight proportionally to the current ability of the indicator to predict prices. “Waves” – Elliott Wave NN forecast. “Candles” – candlestick pattern NN forecast model. “Pattern recognition” – pattern-recognition filter and predictor. “Correlation” – correlation analysis tool to perform analysis and evaluate the future trend using a mutually-correlated pair (or in opposite correlation) with time shift. “Comprehensive 3-month fundamental-technical ratings model” – analyzing-predicting model that is based on key fundamental ratios and technical parameters reflecting a company-stock state and dynamics. SMAP-3 is able not only to extract basic cycles of the stock market (indexes, sectors, or well-traded shares) but also to predict an optimal timing to buy or sell stocks. Its calculation mainly based on extracting basic cyclical functions with different periods, amplitudes, and phases from historical quote curve. Additionally, SMAP-3 enables finding optimal timing to buy/sell by analyzing months of year, days of month, and days of week (the calculation is based on statistical analysis). NNSTP-2 is to help stock traders in predicting stock prices for short terms. It predicts future share prices or their percentage changes (can be chosen in settings menu) using Fuzzy Neural Network (FNN). It operates automatically when creating the FNN, training it, and mapping to classify a new input vector. Traditionally, Parabolic SAR* is considered as a trend following indicator. Probably, few traders would think about using it for prediction. But after testing, I started to believe that it can be successfully used for prediction in conjunction with other indicators, especially, in a trending market. The explanation why it works can be the following. When a trend reverses, the probability of its continuation is more than 50% in average. The software with Neural Network (NN) is able to catch it statistically and show the result in extrapolated curves. The function of SAR in this method is to provide NN with reversal point signals. The initial hypothesis was the following. Since SAR is able to give a strong signal when a price trend is reversing, this signal can be used for predicting if a new trend is prone to last. To compare predictive ability of SAR with other indicators, it has been implemented into the technical analysis module of Fundamental-Technical Analyzer FTA-2. 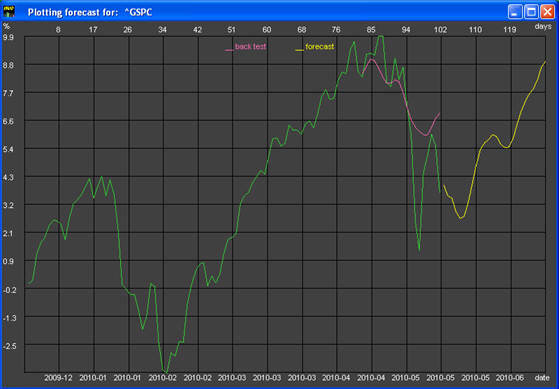 SAR calculations have been used to collect statistics based on the forecast simulations for major indexes and ETFs during August-October 2011 period. As a result, SAR’s position was mostly in “top ten” indicators’ list. The research and presented chart are made by Fundamental-Technical Analyzer FTA-2, one of the software modules that enables composing Neural Network forecasts of many indicators with weights accordingly to each indicator’s predictive ability. EP – Extreme Point (lowest low or highest high). Conclusions. SAR is especially effective in a trending market. To make it more effective in a sideways market, it is a good idea to use it in conjunction with other indicators. Parabolic SAR can be enriched and successfully used for predicting stock market prices. Combing it with Neural Network allows extracting more statistically stable patterns and, therefore, providing a better accuracy in the forecast. As simulations showed, improved results can be achieved if SAR is transformed into more sensitive indicator by subtracting it from close price (it indicates the degree of SAR and price convergence). *) SAR stands for Stop-And-Reverse. It has been used by many traders for decades. Its major application is in trading systems to define a trailing stop, i.e., to protect profit when a price trend changes. The term “parabolic” appeared to characterize the indicator parabola shape that is due to using an accelerating factor in the formula. Article first published as Elliott Wave: Extracting Extremes and Predicting next One by Neural Network on Technorati. The Elliott Wave idea is to use in stock market forecast. It is based on a crowd psychology that changes between optimistic and pessimistic trends creating patterns that can be fitted to reoccurred sequences. To use waves for prediction the assumption is made that waves are developing in the sequence of Fibonacci, harmonic, or fractal ratios. So that each wave has a programmed position and characterized by a particular direction and duration with extreme as a reversal point. In fact, the model has been used by stock market analysts for almost a century. Although it looks very attractive due to its strict formalism and deterministic outcome, its predictive power is weak because of a few reasons. Firstly, the predictive values are dependent on waves that were counted – determining where first and next wave start can be subjective. Secondly, according to Efficient Market Hypothesis, using an exact Elliott Wave model by many traders could lead to the disappearance of the patterns they anticipate. And finally, nowadays one’s trading success based on predictions is rather a chance game in a modern market with its irrational behavior. The purpose of this research was to explore if Elliott Wave principle can be used these days in stock market forecast. To eliminate the subjectivity in counting waves, Neural Network (NN) was used to analyze and predict waves. Also instead of assuming that waves obey only the sequence of Fibonacci, harmonic, or fractal ratios, a more general approach used – the software processes all extracted waves. Besides, employing NN enables identifying both the price and date of extremes. The first experiment has been done using an artificial data set. The data consist of two sinusoidal functions with different periods. The second group of experiments has been done on real market data. The main conclusion is that the Elliott Wave idea can be used in predicting stock market. Although it does not generate always accurate and consistent forecasts, its result can be successfully used as an additional input for making a trading or investing decision in modern market conditions. Investors could benefit from a fluctuating nature of the stock market. A semi-cyclical nature of the market is a bad surprise for some investors but others know how to take advantage of the cycles. To discover cyclical patterns in the market movement, investors use different software tools. Stock market cycles may help to maximize ROI. One of the stock market characters is that it has powerful and pretty consistent cycles. Its performance curve can be considered as a sum of the cyclical functions with different periods and amplitudes. Some cycles known by investors for long, for example, four-year presidential cycle or annual and quarterly fiscal reporting cycles. By identifying the cycles it is possible to anticipate tops and bottoms, as well as, to determine trends. So that the stock market cycles can be a good opportunity to maximize return on investments. It is hard to identify cycles using a simple chart analysis. It is not easy to analyze the repetition of typical patterns in stock market performance because often cycles mask themselves; sometimes they overlap to form an abnormal extremum or offset to form a flat period. The presence of multiple cycles of different periods and magnitudes in conjunction with linear and non-linear trends can form a complex pattern of the curve. Evidently, a simple chart analysis has a certain limit in identifying cycles parameters and using them for predicting. Therefore, a mathematical statistical model implemented in a computer program could be a solution. Be aware: no predictive model guarantees 100% precision. Unfortunately, any predictive model has own limit. The major obstacle in using cycle analysis for the stock market prediction is a cycle instability. Due to a probabilistic nature of the stock market cycles, the cycles sometimes repeat, sometimes not. In order to avoid excessive confidence and, therefore, losses it is important to remember about a semi-cyclical nature of the stock market. In other words, the prediction based on cycle analysis, as well as, any other technique cannot guarantee 100% accuracy of prediction. Back-testing helps to improve prediction accuracy. One of the techniques to improve a prediction accuracy is back-testing. It is the process of testing prediction on prior time periods. At the beginning, instead of calculating the prediction for the time period forward, we could simulate the forecast on relevant past data in order to estimate the accuracy of prediction with certain parameters. Then the optimization of these parameters could help to reach a better precision in forecast. 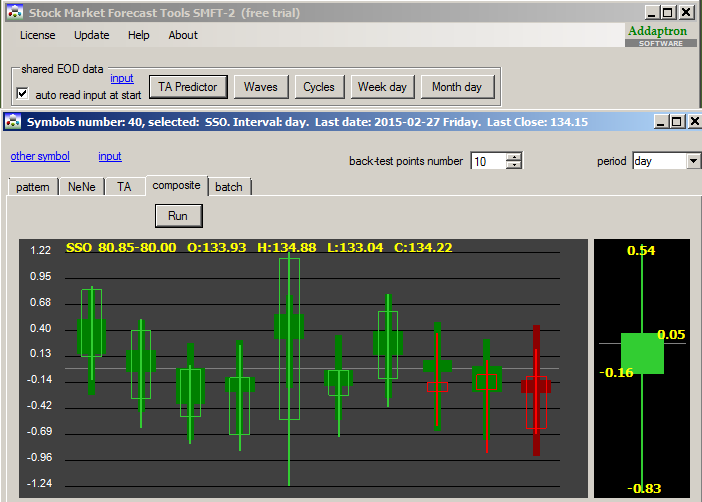 Stock Market Predictor SMAP-3 is a computer program that is based on cycle analysis. To discover different patterns in the market movement, including cycles, investors use different software tools. One of the them is Stock Market Predictor SMAP-3. It is able to extract basic cycles of the stock market (indexes, sectors, or well-traded shares). To build an extrapolation, SMAP-3 uses the following two-step approach: (1) applying spectral (time series) analysis to decompose the curve into basic functions, (2) composing these functions beyond the historical data. The stock market is an alive system – around can be joy or fear but its buy-sell pulse always exists. To discover different patterns in the market movement, including cycles, investors use different software tools. Sometimes, these computer tools are called “stock market software.” The stock market software tools help investors and traders to research, analyze, and predict the stock market. © Alex Shmatov. Published with permission of the copyright owner. Further reproduction strictly prohibited without permission. Neither bear nor bull market is bad because both can be used to the benefits of knowledgeable investors – the most important thing is stock market predictability. Basically, the stock market prediction can be built on the following approaches: Efficient Market Hypothesis (it states that the prices captures all known information), Fundamental analysis (it considers companies performance), or Technical analysis (it uses historical prices and volumes statistics to detect trend). Using the combination of these methods may improve the accuracy of prediction. Any prediction can fail. Nothing in this blog should be construed as investment advice in any way. Always do your own research or/and consult a qualified investment advisor. It is wise to analyze data from multiple sources and draw your own conclusions based on the soundest principles. Be aware of the risks involved in stock investments. The technical charts of forecasts presented here are mostly generated by stock market software tools that have been developed by Addaptron Software ®. The content here is copyrighted and (re)-published with permission of the copyright owner(s). Further reproduction prohibited without permission. You may include a live link to our blog/page on your site/page with the use of proper citation when referring to content found here.